Educational DVDs are a helpful addition to round out your curriculum. Whether you’re looking for something to help with science or language instructions or are simply browsing Reading Rainbow episodes to tackle conduct issues or address life lesson, you can find what you need here. Our collection of Reading Rainbow DVDs includes Best Friends, which exemplifies the importance of kindness and caring and also teaches science concepts such as the needs and responses of living things. 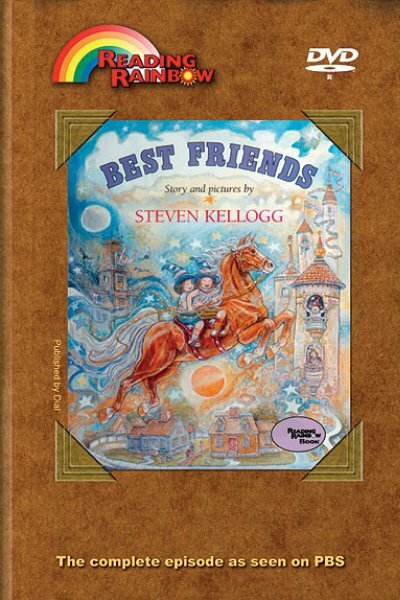 In Best Friends, we learn that our friends can be human or animal, but they are wonderful to have in any case. This DVD tells the story of Kathy, who feels lonely and afraid when her best friend goes away for the summer and leaves her alone. The episode also talks about taking care of a pet and how they make great friends and companions. Students will learn about seeing-eye dogs, and how they are trained to help the blind through the story of a young girl who spent a year raising a dog who will then be trained to assist the visually impaired. Your Best Friend - Kids on the show tell about their best friends. Meet Abby - Beth Richmond tells how she helped train her puppy, Abby, to become a Seeing Eye Dog. Show Dogs - Come to the Rockland County Kennel Club Dog Show and see some wonderful pooches! Click here for Theme Lesson Plan -- "Friends"